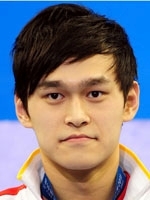 After basketballer Yao Ming and hurdler Liu Xiang, the next Chinese mega star could well be the up-and-coming swimmer Sun Yang, who by his own admission, may do something miraculous as he goes for the 400m and 1500m freestyle titles as well as leading the 4x200m relay team at the 2012 Games. The zenith of Sun's career so far is undoubtedly his performance at the 2011 world championships where he claimed the gold medal in the 1500m with a world record time that broke Grant Hackett's iconic 10-year-old mark. Sun had been widely tipped to challenge Hackett's time of 14min 34.56secs set at the 2001 worlds in Japan, but he had been more than two seconds off the record pace with just 100m to go before somehow finding an astonishing extra gear to shave 0.42sec off the mark. His final 50m lap was covered in just 25.94sec as the Chinese fans at the stadium in Shanghai screamed on with rapturous, roof-lifting, flag-waving, delirious encouragement. Even Hackett himself had said that he had expected Sun, who is coached by the Australian's former mentor Denis Cotterell, to break his long-standing mark, the only swimming world record that had withstood the controversial 'floating' swim suit era. Sun, then 19, won the 2011 world 800m freestyle title ahead of Canada's Ryan Cochrane by a healthy margin of 3.29sec, with Gergo Kis of Hungary third. There had also been a great deal of talk of 'the Duel in the Pool' showdown between Sun and Olympic 400m champion Park Tae-Hwan. The South Korean though threw down a painful Olympic challenge to the rising star Sun, beating him by an almost hard to believe full length. The kicked-back kid looked rather happy with his silver however. "Hopefully, I can create miracles at the Olympics," Sun said recently, claiming he will be faster in all distances at the London Games. Fast tracked through specialist sports academies, Sun took part at Beijing 2008 as a 6ft 6in 16-year-old, making the final of his specialty 1500m but coming home 8th and last. A year later at the 2009 worlds Sun would come 3rd over 1500m and the die was cast for a brilliant future that should propel the handsome, relaxed and trendy youngster into the sporting stratosphere at London 2012.